Today’s review is going to be very different today. This one comes from a company known as Patchworks, and I have reviewed their products in the past before. The last time was for the iPhone 7, Galaxy S7, and the Note 6. Yeah, you heard that last one right. 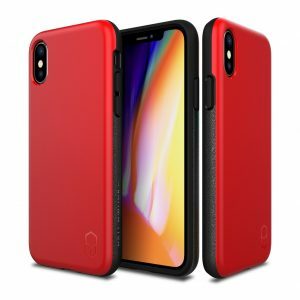 So, I am going to talk about all the cases that I received, starting with those for the iPhone X. Some of these reviews will have pictures, but some will not, and others will have prices that are only temporary. Not certain what the ITG stands for, but maybe its Integrated…I can’t think of anything. Anyway, the Level ITG is certified U.S. Military Standard Drop Protection (MIL-STD-810G) for four foot drops. Part of the reason for this protection is the shock absorbent Air Pocket on the inside that looks like a net. The rest is polycarbonate, and there is some kind of air pocket interior that helps the impact energy dispersion. It even has a pre-built space for a metal plate for a magnetic car kit. You can purchase it on the Patchworks site in red, white, black, and pink for about $12.95. Unlike the Level ITG, the Pure Shield EX is a clear case, but with color on the edges. At least I know what the EX stands for, and it is “extreme”. The Pure Shield EX has the same drop protection of four feet, but does not have that mesh thing going on in the inside. The edges have some kind of air pocket thing going on as well, and it has a real smooth grip about it. 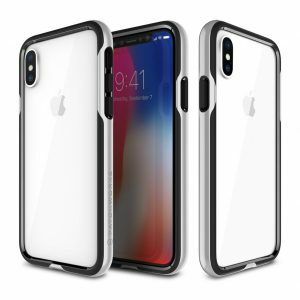 The iPhone X Case Pure Shield EX is available on the Patchworks site for $12.95 with edges of black, gray, white, and red. This next particular accessory is really minimalist, as it is just the edges. I have to admit that it has been a while since I reviewed anything like this. It has that usual four-foot drop test passing grade, and it has an edge around it that has the same air pocket as the Pure Shield EX. This really shows off the front and back of your iPhone X, but could leave the glass exterior a bit more vulnerable. It is available on the Patchworks site for red, white, black, pink, and gray. Now this particular case looks a lot like the Level ITG, but it has a bit of a dotty texture. I don’t know how else to describe the exterior of it other than that. As for the interior, it has that netted mesh look, with corners protected by the Poron XRD Extreme Impact Absorber, a very advanced shock resistant material. It is pretty lightweight, and quite rubbery. This case is available on the Patchworks site for about $11.95, and only in black. If you are not familiar with “aegis”, it is another word for shield. It has that U.S. Military Standard Drop Protection, and has that four foot protection. There is a German Polycarbonate with corners of Poron XD for extreme impact protection, with the mesh look of TPU. It also has the great air pocket interior, and you might notice that the exterior looks quite different. It is available on the Patchworks site in black, red, white, and pink fpr $14.95. Now I am going to switch over to talking about iPhone X screen protectors. In this case, I will talk about another Patchworks product with ITG in its name with the ITG Silicate. The ITG Silicate brags that it is 40 to 60 percent stronger than normal tempered glass screen protectors. So if you are trying to scratch it, good luck. 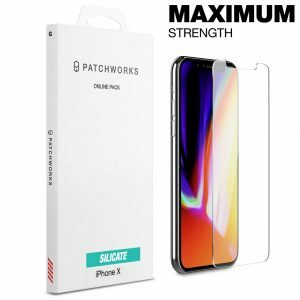 You can purchase the ITG Silicate for the iPhone X on the Patchworks site for $15.95. And now we have another great screen protector to review with the Full Cover 3D. I am assuming that the 3D is in its name because it makes the whole screen…protected. Yeah, the 3D covers the lip and so it is kind of three-dimensional. Yes, the Full Cover 3D has a 9H hardness, anti-fingerprint, beveled edge, and a lot more. Considering the iPhone X being made of glass, you should have a lot of protection with this particular one. The Full Cover 3D can be purchased on the Patchworks site for about $16.95. Okay, I am going to switch gears into the older and newer versions of the iPhone, but this is the Chroma. I am assuming it is called that because it is colorful, but it isn’t like it has a rainbow on it. It is more vivid and metallic and it has the German polycarbonate on the outside and the TPU layer on the inside. 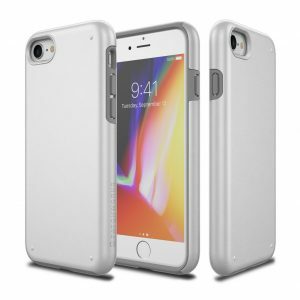 The case can survive that four-foot drop, and it feels more smooth than it does rubbery. You can purchase the Chroma for the iPhone 8/7 on the Patchworks site for about $13.95 in colors of silver, white, black, rose gold, and champagne gold (doesn’t look like the champagne gold is in stock, though). The one for the iPhone 8/7 Plus can be purchased on the Patchworks site here for the same price and colors. As someone who has recently purchased a Galaxy S8, I can say it is a slim phone, and this ITG Level Case is made for it well. 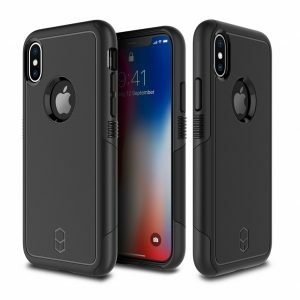 Of course, I have already talked about the ITG Level Case for the iPhone X, and the Galaxy S8 has the four-foot test going on, and that rib pattern on the inside made to take damage. The Patchworks ITG Level Case for the Samsung Galaxy S8 is available on the Patchworks site for $12.95 in both black and red. So, there is a Patchworks ITG cover for the Galaxy S8, and it is no surprise that it comes with most of the same features as the one for the aforementioned iPhone X. If you want a review, this means a 9H oil resistant coating, as well as scratch resistant. It is very easy to install with the double-coated adhesive, and it has a heat binding effect for the curved edge of Samsung’s latest smartphone. 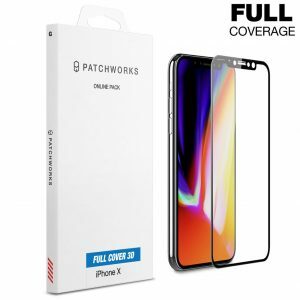 The Patchworks ITG Full Cover for the Galaxy S8 for $14.95 on the Patchworks site. 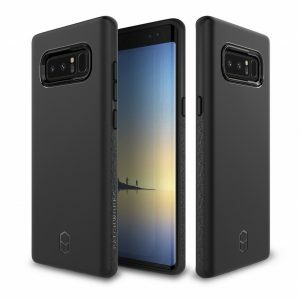 Okay, here’s the Level ITG case for the Galaxy Note 8, and this is what I will focus on for the next few cases/screen protectors. So what are we looking at here? I would have to say nothing new, as it has passed the 4-foot drop test and has the rib patterns on the inside. I believe that in my previous reviews of the ITG Level cases that I didn’t bring up the anti-reflective ring around the camera hole. 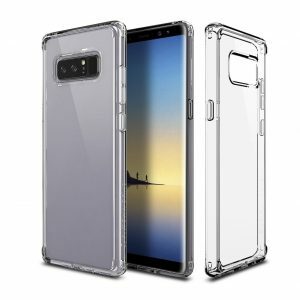 You should be able to purchase the ITG Level Case for the Galaxy Note 8 in red, white, and black for $12.95 on the Patchworks site. 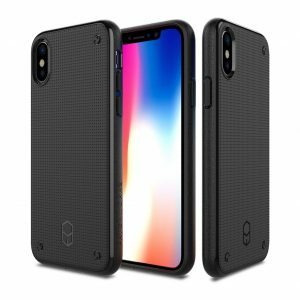 Like I talked about with the Flexguard before, the Flexguard case has a rubbery feel, and it has the dotted texture so it keeps it from slipping out of your hand. It also has that PORON XRD Extreme Impact absorber, which is good for taking what you want to lash out on the Flexguard, which shouldn’t be any more than life itself. Looks like you can have the Flexguard in any color, provided that it is black. It is available on the Patchworks site for $11.95. 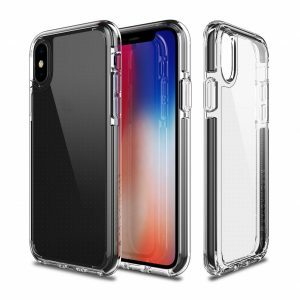 Like the other model I reviewed for the iPhone X, the Pure Shield case is completely clear. This one doesn’t have the “EX” in the title, but that doesn’t meant that it is not “extreme”. This has a strong German polycarbonate with those aforementioned air pockets on the side for extra protection that is, of course, military grade. Yes, it has done the drop test and the protection test, so it is good. 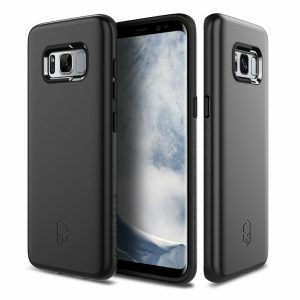 The Pure Shield Case for the Galaxy Note 8 is available on the Patchworks site for $9.95. And now for a most unique case with the Contour! You can see how the back of it has this patch of transparency on it, for some reason. It is a good aesthetic, combining the clear cases with the opaque ones. Apparently, this is the most rugged case ever, but the website says that it has survived the same amount of tests. It has polycarbonate and TPU, so yes, it is very good at what it does. 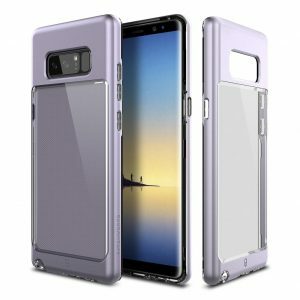 The Contour for the Galaxy Note 8 is available on the Patchworks site for $13.95 in Orchid Gray, Contour Gold, Black, and Deep Blue. Okay, I am going to go ahead and end my review here, with just a few notes. 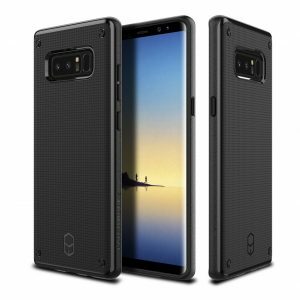 First, there is a Full Cover for the Galaxy Note 8, and the one that I received said “Full Cover 3D”, which I believe is available on the Patchworks site for $14.95. 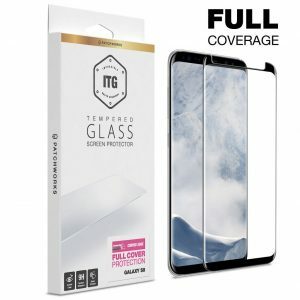 As someone who is personally using the Flexguard for the LG G6 (available on the Patchworks site for $11.95), as well as the Screen Protector for $11.95 on the Patchworks site. I can highly recommend Patchworks products, and look forward to reviewing more in the future.